She used to show no fear as a youngster playing mini rugby in Hawick, even barging past new Scotland star Darcy Graham on occasion – and Lisa Thomson’s exciting career is well and truly on an upward curve after she was named the new captain of the women’s national team. When she first arrived on the international scene back in the 2016 Six Nations the 18-year-old centre was, not surprisingly for one so young, a timid character. However, during that tournament she showed glimpses of what she was capable of and in the 2017 event, when Scotland finally won matches after a long wait, she played a starring role. Last season saw her spend a year playing professionally in France with LMRCV and now she is turning out for Darlington Mowden Park Sharks in the Tyrrell’s Premier 15s in England and back studying at Edinburgh University. Now 21, she is set to earn her 17th cap this afternoon against Italy in Calvisano – and head coach Shade Munro has seen enough from her to back her as his captain. “Shade phoned me up a couple of weeks ago, I was actually doing a university project watching a basketball game,” Thomson recounts. “He just said ‘So, how do you feel about captaining the squad?’ I was just quiet for a couple of minutes, then I said ‘Yeah, of course, I’d love to do that’. 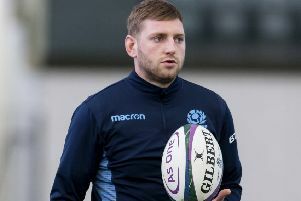 “Until I was captain for the sevens team [last summer] I hadn’t really envisaged being captain for the Scotland XVs squad, but as soon I’d captained the sevens team I thought I’d love to do it. “It has come earlier than expected, like everything does in sport, but it’s just a great honour to captain your country. “Going to France and playing rugby was a great experience. Completely being out my comfort zone on and off the pitch with the language barrier and everything else definitely made me a more robust player in terms of getting and giving feedback and stuff like that. “It’s definitely helped in terms of captaincy and leadership. The last time Scotland were in Italy they lost out 26-12 back in March in terrible conditions during the Six Nations. Thomson missed that one through injury and is looking forward to this clash: “We expect the Italians to be quick. They’ve got good back three players, good handling skills. “Last time they just outplayed us – we were both in the same conditions, both had to deal with it. They’ve also got physical forwards, so we’ll need to front up there and look after our own ball.